This post is sponsored by Almond Breeze Almondmilk. As always, all opinions and content are my own. Let’s talk special breakfasts. 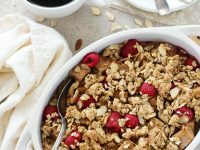 The kind that are full of fresh raspberries, dreamy whole wheat carbs and will make your guests swoon. 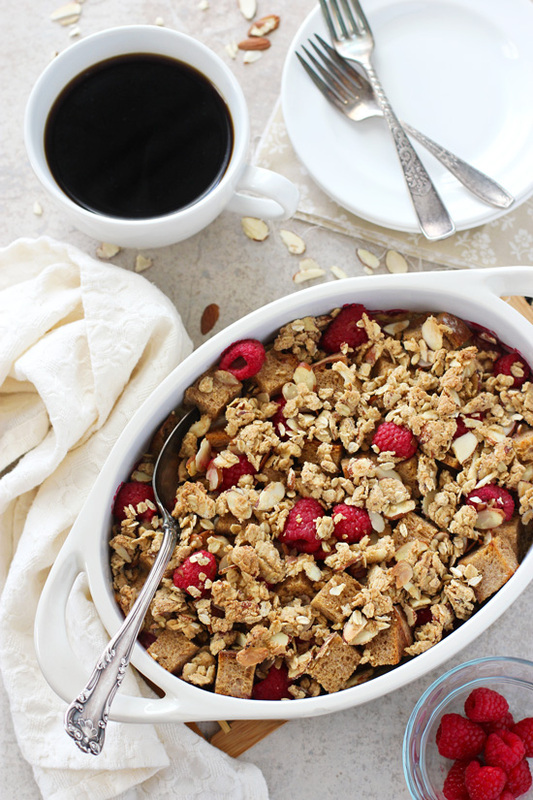 Like this raspberry almond baked french toast! And to make it even better, you prep it the night before. Which means you are winning at life. Or mornings. I could definitely use more winning mornings. I am very much a stumble downstairs and turn on the coffee maker immediately kind of girl. A don’t talk to me until I’ve drank said coffee kind of girl. So I feel all over it when I manage to prep breakfast the night before. I can handle turning on the oven and spending five minutes mixing up a quick little sort of granola crumble topping while my coffee is brewing. Because oh yes, there is a topping. But first, let’s back it up a bit. Let’s talk about the french toast base, which you’ll prep entirely the night before. We have some cubed whole wheat bread. Some gorgeous plump fresh raspberries. Some sliced raw almonds. All of which are layered into a baking dish. Next, we’ll whisk together the wet ingredients. Some eggs, some vanilla and almond extracts, and some spices. Along with some milk. I love me some almond milk (it’s my go-to for smoothies) and we’re using it here today as well. 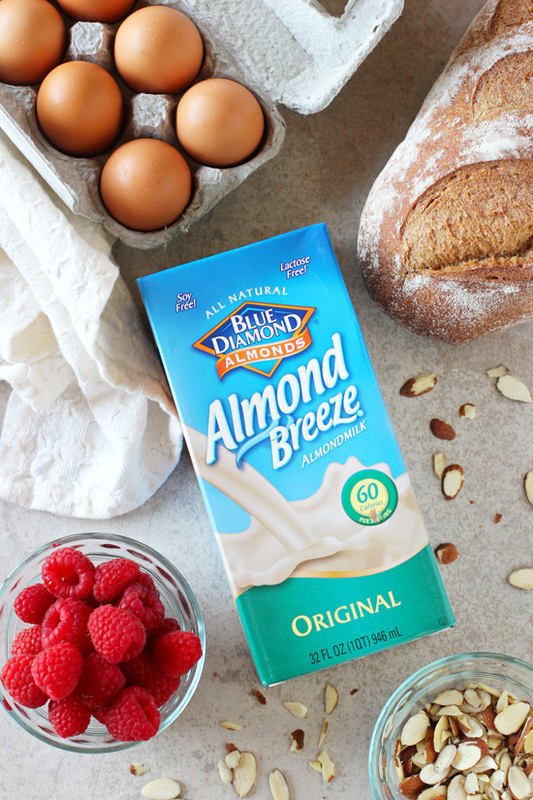 Specifically some Almond Breeze Original Almondmilk. It reinforces the flavor from the sliced nuts and the almond extract perfectly, giving it an extra little oomph. So, we’ll then pour this wet mixture over the layered bread cubes in the baking dish, wrap the whole thing tightly with plastic wrap and pop it into the fridge to sit overnight. The next morning, the french toast is baked off after we add on that aforementioned crumbly oat topping. There’s just enough to add an extra little crunch but not so much that it feels over the top or too decadent. The dish comes out all warm and golden brown from the oven. You can serve it just as is or with some fresh raspberries on the side. And of course some coffee. A big ol’ mug of steaming coffee. You knew I was going to say that, didn’t you. 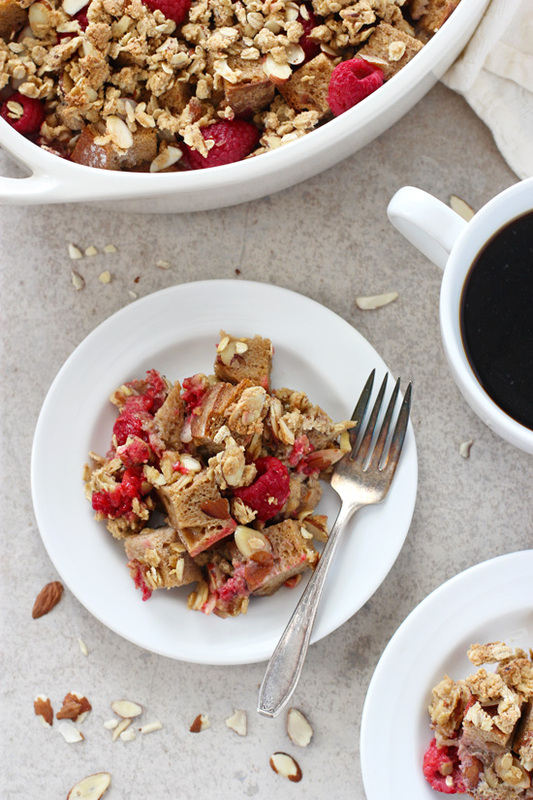 Recipe for overnight raspberry almond baked french toast. 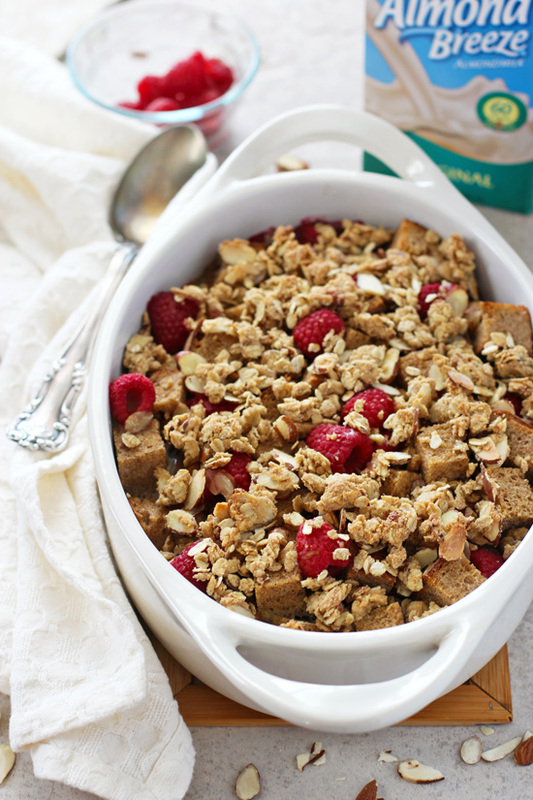 With whole wheat bread, fresh raspberries and an easy granola crumble topping! Spray a 2 to 3-quart baking dish with olive oil or nonstick cooking spray and set aside. In a medium bowl, add the eggs and beat with a fork or whisk. Add in the milk, maple syrup, vanilla extract, almond extract, cinnamon, nutmeg and salt. Whisk until well combined. Add half of the bread cubes to the prepared baking dish. Top with half of the raspberries and then half of the almonds. Top with the remaining half of the bread cubes, then the remaining half of the raspberries and almonds. Evenly pour the egg mixture over the top. When ready to bake, preheat the oven to 375ºF. In a medium bowl, add the oats, flour, almonds, cinnamon, nutmeg and salt. Toss to combine. Pour in the maple syrup and the olive oil and mix until evenly moistened. Remove the plastic wrap from the baking dish with the bread cubes and use your fingers to crumble / sprinkle the topping evenly over the top. Cover the dish with foil. Bake for 20 minutes then remove the foil and bake for another 15 to 20 minutes. It should be golden brown on top and should not really “wiggle” if you shake the pan gently. Let stand for about 10 to 15 minutes. Serve with additional fresh raspberries if desired. *Try to use at least one day old bread for this recipe. If it’s even older that’s good too! Prep time does not include time to let the base sit overnight in the fridge. This post is sponsored by Almond Breeze Almondmilk. All opinions and content are my own. As always, thank you for reading and letting me share companies that I love.